When you run an app in development or testing, it can be okay for session data to be lost during app restarts. However, in production this is rarely okay. That is why the default in-memory cache will not be able to support your session data. All data in it will be lost if the app process is stopped. Another reason why in-memory session state is often avoided is that applications may be run on a web farm. In this case multiple instances of the app exist, and a user might connect to any of them. One way to solve this problem is session affinity. Then a user would always connect to the same instance. But what happens if the instance goes down? If you cannot guarantee that the user can always connect to the right instance that will have their data, it is better to store the session data outside the instances. In this article, we will look at how to use Redis as a session data store. To use Redis cache locally, I installed the 64-bit version of Redis for Windows via Chocolatey: https://chocolatey.org/packages/redis-64/. After installation, I started it by running redis-server. In this case I used appsettings.Development.json to hold the development-environment connection string. The important ones here are services.AddSession(), services.AddDistributedRedisCache(), and app.UseSession(). app.UseSession() must be called before middleware that require access to session data. The session store automatically uses whatever distributed cache is available, so utilizing Redis for it requires no additional configuration. Here we use LoadAsync and CommitAsync to load and save data to/from the distributed data store, in our case Redis cache. Data will be loaded synchronously if you do not. Exceptions during load will be captured and logged. You can see it here in the source code. By using the two asynchronous functions you get exceptions if there are connection problems, instead of just a log message. In production I will use Azure's Redis Cache service together with an Azure Web App. Creating a Redis cache is pretty straight-forward. You can find it in the Azure Portal from New -> Databases -> Redis Cache. Once it has been created, you can find Access Keys from its blade. Copy the primary connection string. 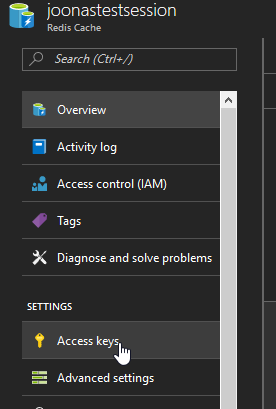 After opening the Web App's blade, we need to open Application Settings. Under Connection strings, we must specify Redis as the name, and the connection string as the value. The name must match the name of the connection string property in the configuration. Make sure you use the Custom type. Do not use Redis Cache as the type. The ASP.NET Core configuration system will not find it if you use it. We can of course use it for other caching purposes as well. Using Redis to store session state in ASP.NET Core is super easy. Hopefully you found this article useful!